The InkJet technique was normally used in ink printers and has experienced a massive developement since the 1950’s. At present, it is also used in preparation of printed circuits, 3D printing, cover layering and other high-tech methods of modern industry. InkJet technique is based on a nozzle system able to generate small liquid droplets. The droplet size is dependent on the type of the InkJet printhead and on the properties of dropped liquid, but in general it does not exceed 100 μm in diameter. The so-called Drop-on-Demand printhead with a piezoelectric actuator is used in our work. The principle of Drop-on-Demand printing is the following: a volume change in a small capillary caused by an actuator (piezoelectric in our case) ejects the liquid from the capillary outlet. The liquid then creates a small droplet at the orifice of the capillary due to surface tension. InkJet experimental setup. The control unit driven by software sends electric pulses of the required waveform to the piezoelectric actuator in printhead. This causes contraction of the piezoelectric crystal, which pumps the liquid from the orifice of the printhead capillary. 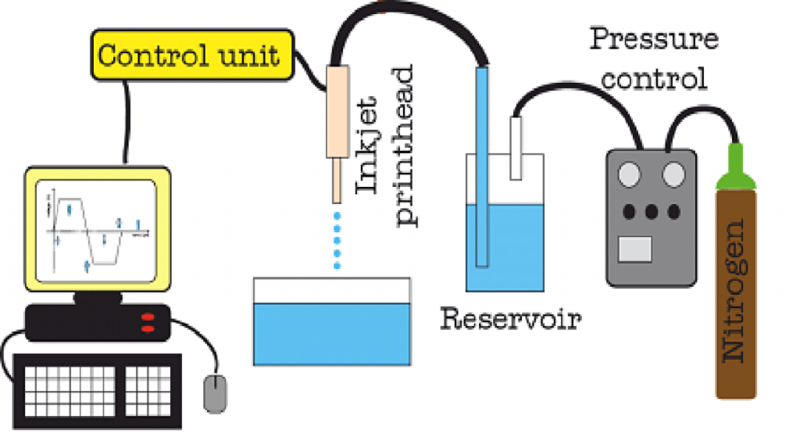 The InkJet printhead is filled from a reservoir connected to a pressure control unit for stable pressure conditions during printing. Generated alginate droplets fall to a pool with a aqueous solution of CaCl2 where the gel particles are immediately created. The aim of our work is to use the InkJet Drop-on-Demand technique for reproducible laboratory-scale fabrication of calcium alginate microcapsules, including those containing inner inclusions (liposomes, yeast). Particle size in the range of 30–90 μm can be achieved depending on the alginate concentration and inkjet parameter settings. The advantages of the inkjet method are reproducibility of particle size, ability to work with small volumes (beneficial especially in early-stage prototyping) and relatively benign conditions (low shear rates, atmospheric pressure, room temperature). The InkJet printhead from Microfab Corporation (type M5-ABP-01) is used throughout our work.